Cyber security is everyone’s business and each of us is responsible for being a good online citizen. By educating ourselves about online safety, we raise our awareness level and thus, our protection. This week’s Cyber Security Awareness Month article provides some specific considerations for Internet users who want to remain good online citizens. Remember that anything posted online is subject to discovery, whether by colleagues, friends or future employers. Posting online can influence opinions and impact relationships. Remembering this is a helpful measure when deciding what to post. Safer for me, more secure for all. Help protect yourself and others by following the mantra: when in doubt, throw it out. If an email, post, or ad looks suspicious, even if you know the source, it’s best to delete it and mark as spam. Ensure your device’s security software is up-to-date to protect you from viruses, malware, phishing and other online threats. 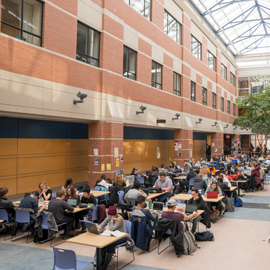 If you suspect you’ve fallen victim to a cyber attack or have accidentally clicked on a fraudulent link, contact the ICT service desk at x4357 so that ICT can take the appropriate steps to protect you and the rest of the Laurier network. Cyber Security Awareness Month is an initiative that began in the United States under the direction of the U.S. Department of Homeland Security. It is observed every October and offers an opportunity to reflect on the importance of online safety. Each year there are weekly themes that address some of the top issues in cyber security, and Laurier’s ICT department participates by sharing the most relevant information with our faculty, staff and students. Stay tuned for weekly posts throughout the month of October containing important tips on how you can protect yourself, your information and Laurier – online.